At the end of this slow and quiet weekend, although I still wasn’t feeling 100%, I did have a feeling of calm about me that I don’t always have on a Sunday evening. I started thinking of all the things I didn’t “do” – and had the thought “I didn’t get very much done on my ‘to do’ list” but was okay with it because I knew I needed to rest. My next conscious thought was “what if when we wake up in the morning, instead of creating a mental ‘to do’ list, we instead created a ‘to be’ list?” How do I want to BE today? I want to be love, I want to be kind, I want to be generous, understanding, compassionate, forgiving… and the list could go on. Wouldn’t it be wonderful to make a conscious choice to BE one or two of these amazing traits for the day? 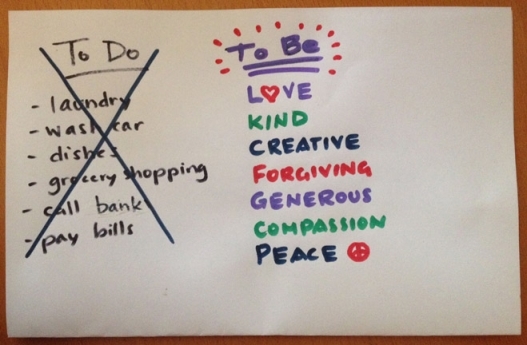 The “to do” list will never go away – and quite frankly we will always be adding to it. During the day, I try to remember my intentions and re-align my thoughts if necessary. I know many (many) days I won’t meet the standards I will mentally set for myself ~ but I promise myself that I will never stop trying. After all ~ we are human”BE”ings, not human”DO”ings.